A big change is afoot in classroom design that soon might make traditional class design obsolete. Called the Active Learning Classroom (ALC), it is nothing short of a complete transformation of how and where college students learn. Like a breath of fresh air for higher education, ALC moves education from a stodgy teacher-centric recitation to a group dynamic by pushing communications and collaboration to the limit. Rather than professors lecturing, hoping that students passively absorb the lesson, ALC stresses student interaction, creativity and – as the name implies – active learning. Regardless of whether it’s a seminar on subatomic particles, modern art or African history, the age of interaction has arrived at colleges. To foster this ideal of interpersonal communications and collaboration, classrooms will replace desks set up in neat rows with a design that emphasizes flexibility and movement. Because students no longer must sit in rows with their eye’s forward on the board, they can communicate with those around them to jointly solve a problem, interpret a text or critique each other’s writing. At its best, ALC fosters students working together to meld them into an imaginative and creative team capable of much more than any single student can accomplish. This focus on interpersonal skills and teamwork means that the basic classroom needs to adapt to the needs of education, not the other way around. Take Robert H. Bruininks Hall at the University of Minnesota’s College of Biological Sciences in Minneapolis, which has become a laboratory for fostering collaborative learning. 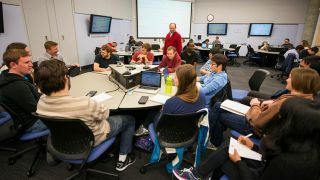 Among the first to reconfigure its classrooms for active learning, its newly renovated classrooms have individual trapezoidal shaped desks that can be fit into a donut-shaped table to accommodate eight or nine students with a connection panel at the center. But, all this movement means that the room’s central projector aimed at the head of the classroom needs to take the backseat to other audio-visual devices. The Bruininks Hall ALC classrooms continue to have a central projector for when everyone needs to see the same image or video. But, the walls are also lined with a dozen smaller screens that afford a good view, no matter which group you’re in and which way your head is turned. The key to making ALC work is that rather than the same thing having to be displayed on all the screens, each group can use their own screen, work out their problem’s solution and then share it with the others. Students bounce thoughts off each other, evaluate them along with suggested solutions and generally works as a team attacking the problem. It takes a flexible teacher as well, and the professors and instructors go from table to table to check on progress. If they’re not asking key questions of students then they’re hinting at a path to the solution or nudging each group in the right direction. When they see a group with an innovative approach or technique, they can direct their video for the entire class to see.